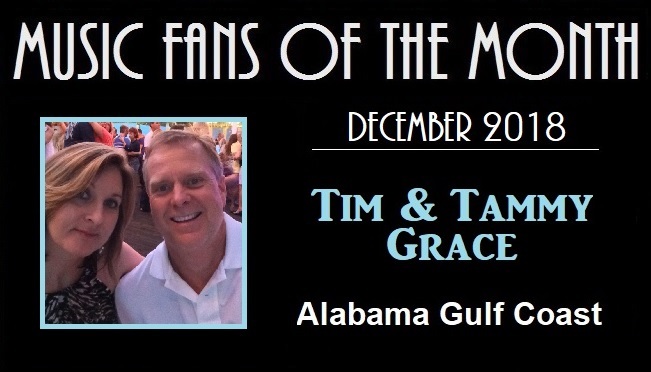 The Southland Music Line is pleased to name Tim and Tammy Grace as December 2018’s Music Fans of the Month. They can be found at numerous live music events across the Gulf Coast, including “The Sunday Socials” at The Frog Pond at Blue Moon Farm, Mobile’s South Sounds and The Mississippi Songwriters Festival. 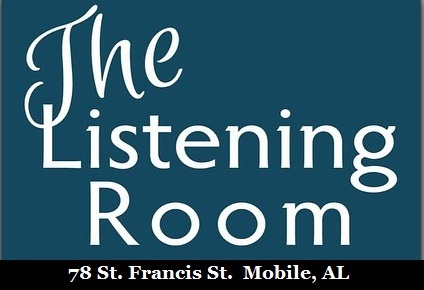 They are loyal supporters of The Listening Room of Mobile, often enjoying the music of their daughter Madison – a rising star on the local scene. We look forward to attending many more great shows with the Grace family. 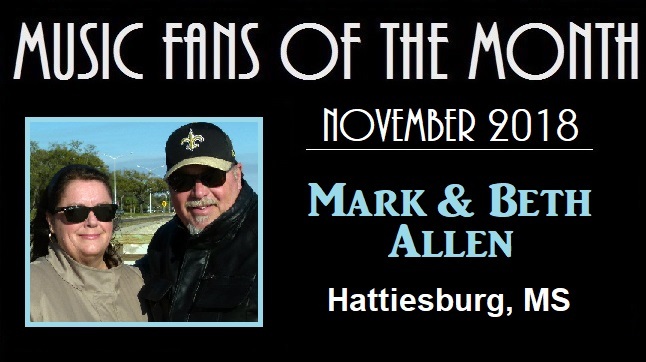 The Southland Music Line is pleased to name Mark and Beth Allen as November 2018’s Music Fans of the Month. They can found attending at some of the region’s best live music events and concerts, including Willie Sugarcapps at Eddie’s Attic in Decatur, GA, Mac McAnally with Jimmy Buffett at The Grand Magnolia Ballroom in Pascagoula, MS and Sugarcane Jane at Slowboat Brewery in Laurel, MS. We look forward to attending many more great shows with this awesome couple. One of the best things about regularly attending live music events is meeting wonderful fans of sensational music who become good friends. 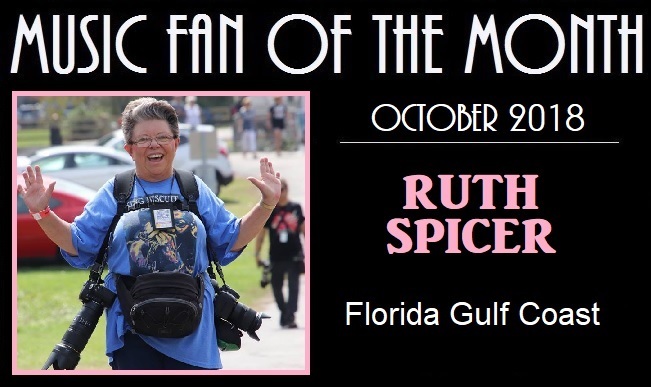 This month The Southland Music Line recognizes music photographer Ruth Spicer as Music Fan of the Month. We first met Ruth at the Bogalusa Blues & Heritage Festival in 2014. She attends Blues festivals, music events and shows across the country including the King Biscuit Blues Festival. Her fabulous work has been featured in Rock Legends, Blues Concert Photos, Surface to Air Media Group and a variety of other music and photo outlets. It is an honor knowing Ruth and having the opportunity to enjoy her wonderful photography. 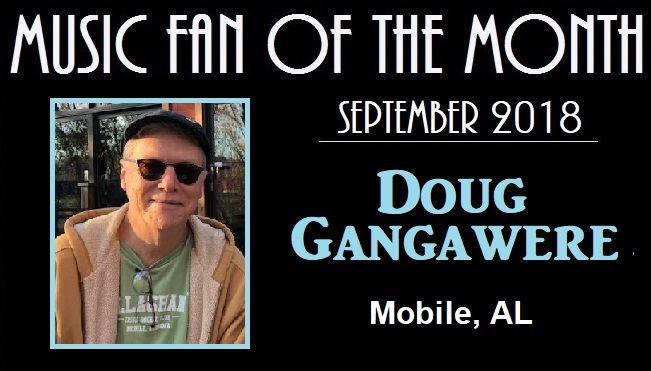 The Southland Music Line is pleased to name Doug Gangaware as September 2018’s Music Fan of the Month. 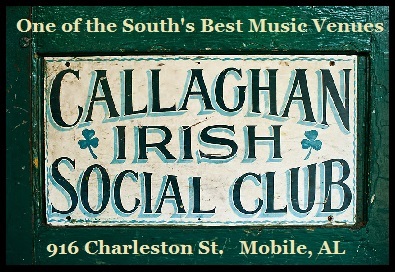 Doug can be seen at several of the region’s best music venues such as Callaghan’s Irish Social Club and The Listening Room of Mobile (AL). His support is a great example of what is needed for a local music scene to thrive and prosper. We look forward to enjoying music with Doug for many years to come. 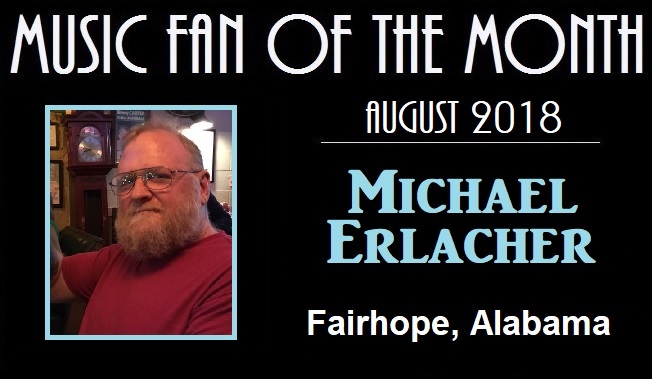 The Southland Music Line is pleased to recognize Michael Erlacher as the August 2018 Music Fan of the Month. Michael makes it a priority to attend and support some of the best live music across the Gulf Coast. We find it a joy attending live music with him and look forward to continuing to do so in the months and years to come. 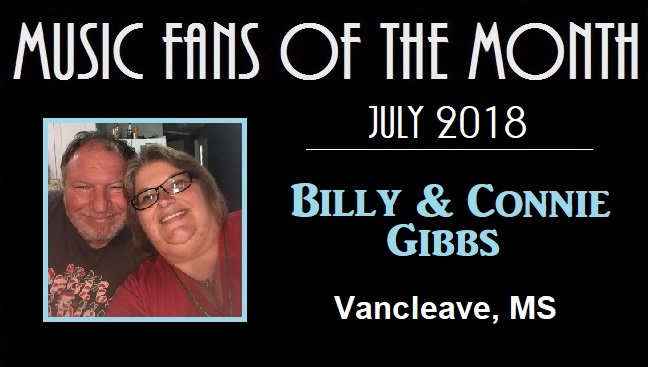 The Southland Music Line is pleased to name Billy and Connie Gibbs as July 2018’s Music Fans of the Month. This recognition is long overdue, because of their enduring love of incredible music. Connie has assisted The Southland Music Line with editing and as an article consultant – her contributions are much appreciated. Oh, and she loves “King George”….yes, Mr. “King of Country” George Strait. Thanks Billy and Connie for your friendship and support. The Southland Music Line is pleased to name Keith & Yedda Trawick as June 2018’s Music Fans of the Month. Only a select number of people understand the meaning of being a “true music fan”. Keith and Yedda are such fans when it comes to legendary music artists like the great Merle Haggard. This month we recognize this wonderful couple for their love of “real” music. 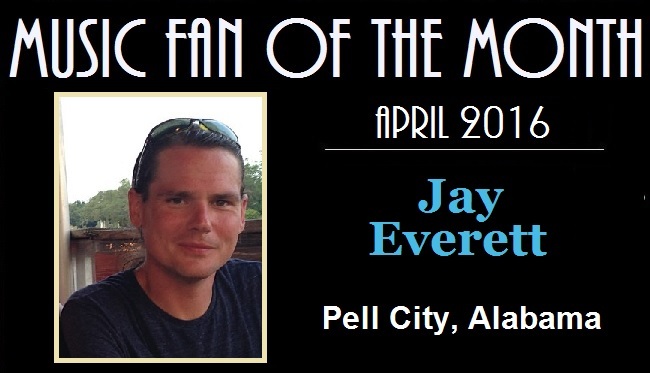 The Southland Music Line is pleased to name Steven Dale as May 2018’s Music Fan of the Month. His work as a TV producer, videographer and owner/operator of “Gulf Coast.stream” has helped broaden interest in many of the region’s best musicians and music venues. His contributions to The Southland Music Line and our TV show “Music Scene” are greatly appreciated. 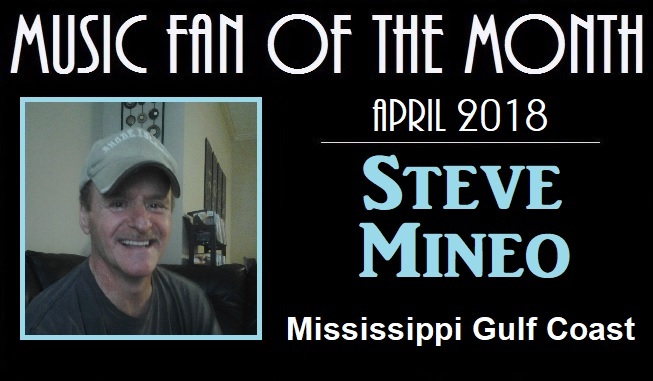 The Southland Music Line is pleased to name Steve Mineo as April 2018’s Music Fan of the Month. Steve attends numerous live music events across the Gulf Coast and can regularly be seen at shows by Grayson Capps & Corky Hughes, Sugarcane Jane and Jimmy Lee Hannaford. As a loyal supporter of the local scene, he was an easy choice for this month’s recognition. The Southland Music Line is pleased to name James and Sarah Kennedy as March 2018’s Music Fans of the Month. 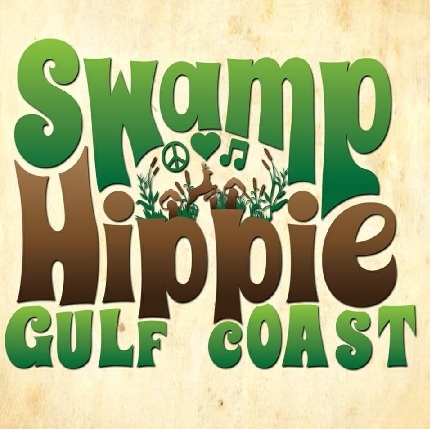 James, a talented videographer, can be seen recording and photographing live music events across the region for “Swamp Hippie Gulf Coast”. Because of their abundant appreciation for musicians and venue owners, recognizing James and Sarah was an easy choice. 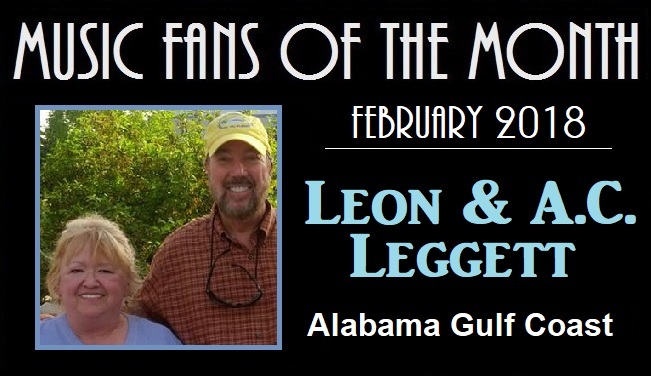 The Southland Music Line is pleased to name Leon and A.C. Leggett as February 2018’s Music Fans of the Month. This charming couple can be found at numerous live music events across the Gulf Coast, including The Frog Pond at Blue Moon Farm. As loyal supporters of the local music scene and its array of talented musicians like Grayson Capps, Sugarcane Jane and others, they are an easy choice for this month’s recognition. 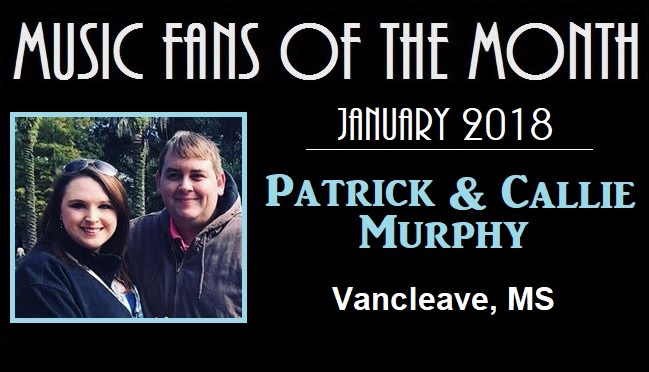 The Southland Music Line is pleased to name Patrick and Callie Murphy as January 2018’s Music Fans of the Month. They are a longtime supporters of the live music scene and are an easy choice for this month’s recognition. 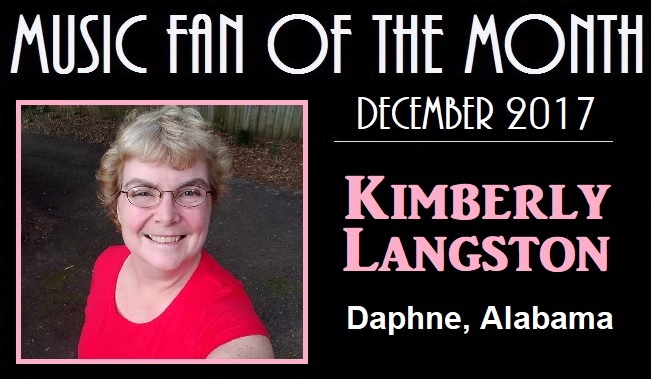 The Southland Music Line is pleased to recognize Kimberly Langston as the December 2017 Music Fan of the Month. Kimberly, an avid horse racing enthusiast, also makes it a priority to attend some of the best live music venues across the Gulf Coast region. She can regularly be found assisting as a merchandise rep at many Sugarcane Jane shows. We find it a joy attending live music with Kimberly and look forward to continuing to do so in the months and years to come. 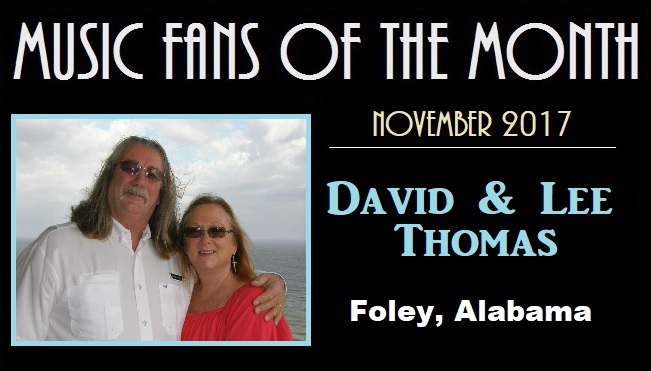 David and Lee Thomas, are very deserving of recognition for their enthusiastic support of live music and The Southland Music Line is pleased to name this couple as November 2017 Music Fans of the Month. 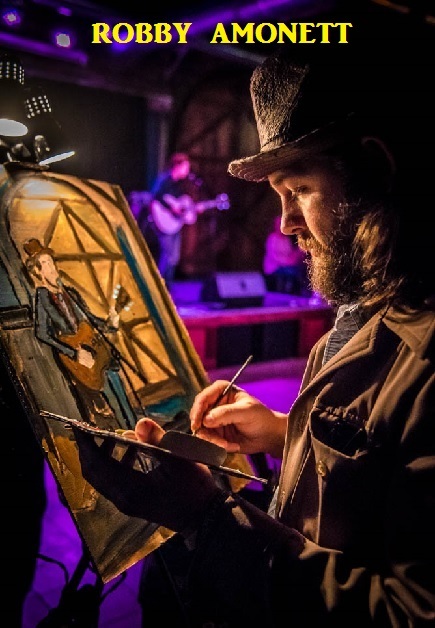 Ever on the lookout for new bands like the Red Clay Strays and faithful supporters of great established talent like Sugarcane Jane and Grayson Capps, their love of music takes them to venues throughout the Southeast and beyond. Thanks for making music such an important part of your lives. The Southland Music Line looks forward to your company at many more great music venues. 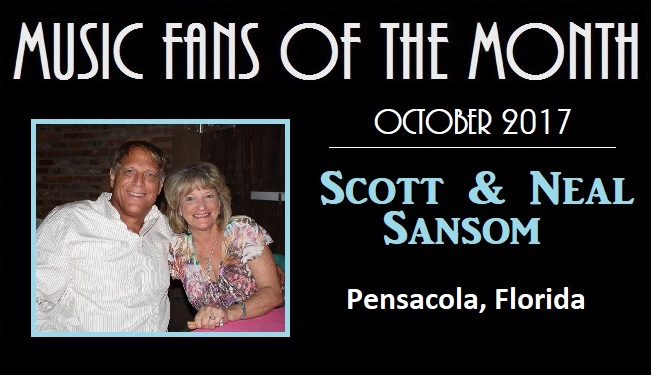 The Southland Music Line would like to recognize Scott and Neal Sansom as the October 2017 Music Fans of the Month. Their deep appreciation of music, singers and songwriters is evidenced by their willingness to travel from their Florida home to live music venues throughout the Gulf Coast. It’s always a pleasure to attend shows with these longtime music enthusiasts at such great locations as Callaghan’s Irish Social Club in Mobile, Murky Waters of Ocean Springs and Pascagoula’s Jack’s by the Tracks. The Line looks forward to hearing more amazing music with the Sansoms in the future. While traveling throughout the United States, Charlie and Christine Wright have made it a point to support local music venues and musicians wherever they called home at the time. Living now in L. A. 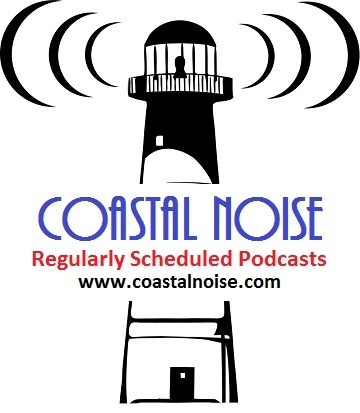 (Lower Alabama) they have expanded their dedicated support and appreciation of local music to include the entire Gulf Coast and can regularly been seen attending shows at such great venues as The Listening Room of Mobile, The Shed BBQ & Blues Joint, Jack’s by the Tracks and The Frog Pond at Blue Moon Farm. 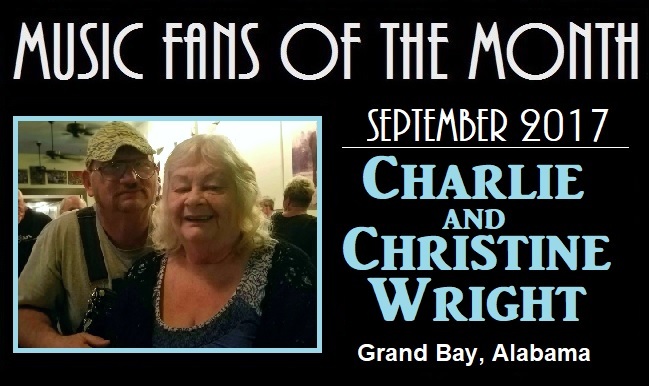 The Southland Music Line is pleased to recognize these two devoted music enthusiasts as the September 2017 Music Fans of the Month. Thanks Charlie and Christine for all you do to support local music! There are music fans, and then there are “MUSIC FANS”. 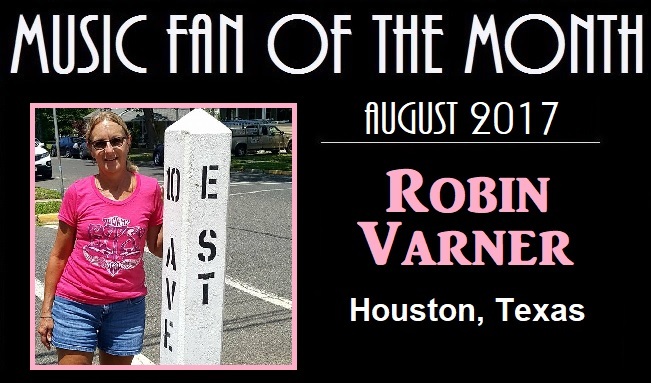 This month, The Southland Music Line recognizes Robin Varner of Houston, Texas. She is an easy choice to acknowledge because of her incredible love for music, and in particular, the music of Bruce Springsteen. She has traveled overseas and across the U.S. to see “The Boss”. We first came in contact with Robin prior to our own jouney to Australia and New Zealand to follow Springsteen’s tour. It’s an honor to share a love for great music with Robin and we thank Birmingham Steve for introducing us. 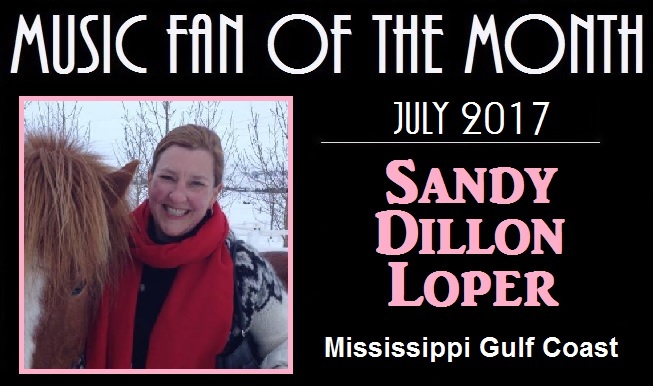 This month we would like to recognize Sandy Dillon Loper as Music Fan of the Month. Sandy has long been an enthusiastic fan of live music. In 2016, she attended the Desert Trip Festival in Indio, CA to see such legendary music icons as The Rolling Stones, Neil Young, The Who, Bob Dylan, Roger Waters and Paul McCartney (a show The Line’s Johnny Cole also attended). Sandy’s support for local music is clearly evident as well and she can regularly be seen enjoying Gulf Coast artists at Jack’s by the Tracks. Thanks, Sandy, for supporting live music. The Southland Music Line looks forward to seeing you at many more great shows and venues. The Southland Music Line’s June 2017 Music Fans of the Month, Danny ”Toad” Smith and Sara Jones Smith are extraordinary music enthusiasts and very deserving of recognition. This talented photographer and accomplished jazz flutist can often be seen enjoying local and national musical artists at such venues as Jazz Fest, Jack’s by the Tracks, Callaghan’s Irish Social Club and many more noteworthy locations along the coast. Their strong appreciation and support of live music is well known and we always enjoy attending shows with this great pair, especially when “Sister Sara” shares her considerable musical talent with us while sitting in with a band. 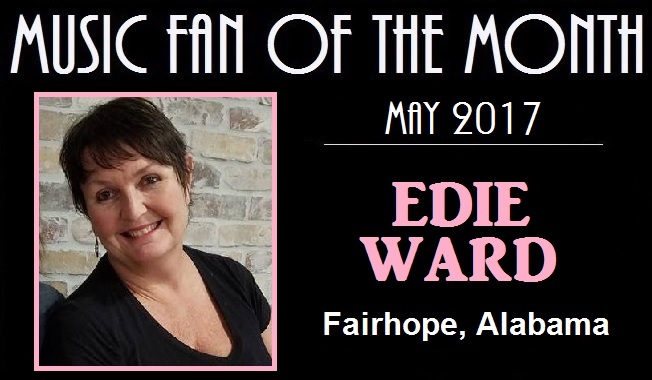 The Line would like to recognize long time music supporter Edie Ward as our Music Fan of the Month. Being a resident of L A (Lower Alabama) Edie regularly takes the opportunity to attend the ever-present great music venues in her area such as The Listening Room, Callaghan’s Irish Social Club and Manci’s Antique Club. The Frog Pond at Blue Moon Farm is also a favorite venue of Edie’s. She attended their very first show in 2009 and has been an ardent supporter since. When attending shows with Edie, her appreciation of music is evident to all around her and we look forward to seeing her at more venues in the future. 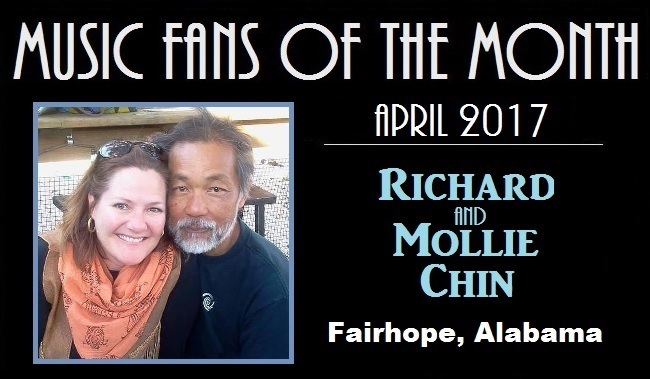 This month we want to recognize Richard and Mollie Chin as Music Fans of the Month. They are true devoted fans of the local music scene and can regularly be found in some the Gulf Coast’s best music venues such as Callaghan’s, Manci’s and The Listening Room. It doesn’t matter where you see this charming couple, whether it be at The Frog Pond at Blue Moon Farm or a local house concert, they are a welcome sight. We speak for everyone, it is a pleasure attending shows with The Chins. Each and every month, The Southland Music Line recognizes fans of incredible music. Over the course of time, we have named several loyal and devoted fans. This month is another long overdue addition to our growing list. 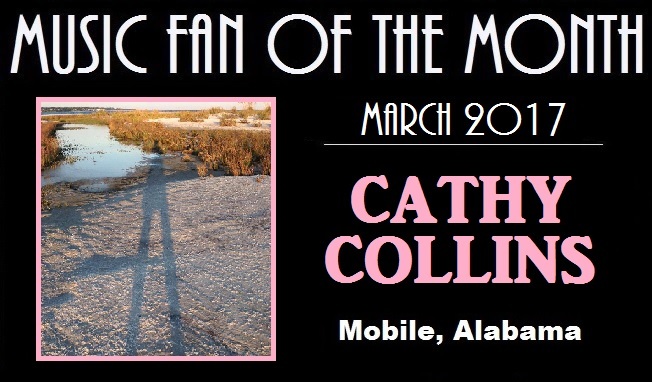 Cathy Collins can be seen attending various music events across the Mobile, AL and Gulf Coast region. In February of 2017, she joined a number of like-minded friends on the famous Cayamo Cruise, which unites fans with some of Americana music’s best talent. Locally, it is a joy visiting with Cathy at places such as Callaghan’s, The Listening Room and Manci’s. Her enthusiasm for music is addicting and appreciated. When it comes to enthusiastic music fans, Christine Kennedy fits the bill. She frequently attends The Frog Pond at Blue Moon Farm and can also be spotted at an array of music venues like Callaghan’s Irish Social Club in Mobile, AL. She has taken trips to Pascagoula and Bay St. Louis, MS for Jazzfest Unplugged just to hear great music. 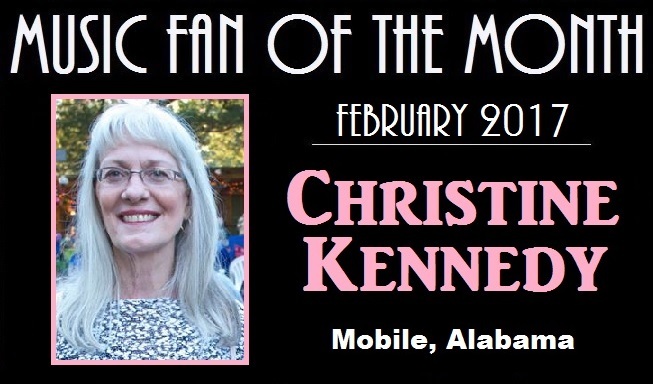 She is an easy choice for this month’s “Music Fan of the Month”. We always look forward to seeing her and spending time together enjoying spectacular music. This couple has proven themselves to be true fans of great music. They have attended shows around the country from Alaska to New Orleans to San Diego to Austin. Jeff is an avid collector of guitars and enjoys playing them. His wife Patsy has spent a number of long hours assisting The Southland Music Line and her contributions are appreciated. In 2015 and 2016, Jeff and Patsy spent time with The Line’s Johnny Cole and Stephen Anderson at Austin’s South By Southwest and the Texas music landmark Gruene Hall. Their recognition as Music Fans of the Month is long overdue. What is the true definition of a music fan? Many things factor into a reasonable answer. One thing is support of the local music scene. Julie Pittman from southern Alabama is one such person who regularly attends numerous shows. She can be seen at Alabama venues such as The Listening Room in Mobile, Manci’s Antique Club in Daphne and the ever so loved Frog Pond at Blue Moon Farm in Silverhill. 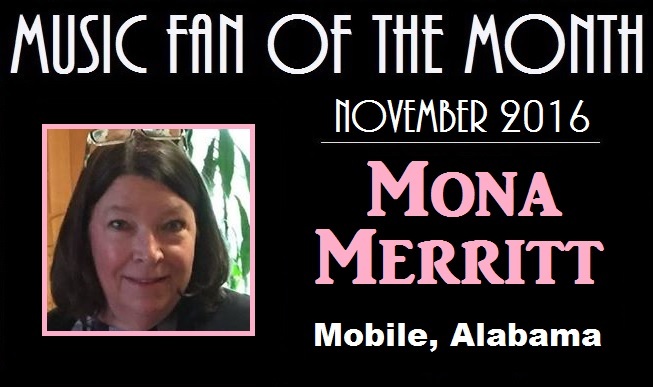 The Southland Music Line recognizes her as December’s “Music Fan of the Month” for a number of reasons including the joy of visiting with her and discussing music. Thank you Julie for your kindness and being a real music fan. 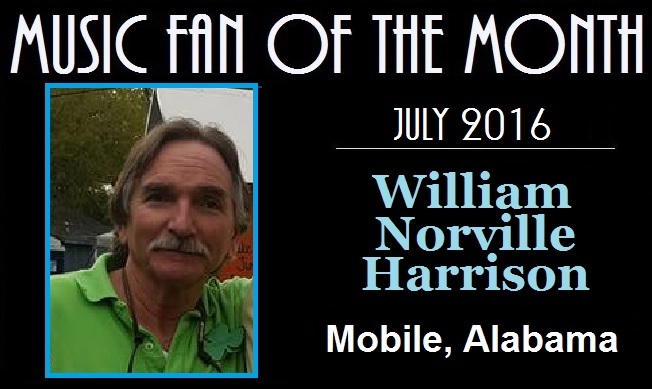 The Southland Music Line continues to recognize devoted music enthusiasts as Music Fans of the Month. This month we want to highlight good friend and loyal music supporter Mona Merritt. She can be seen attending and assisting at various music events across the Mobile, AL and Gulf Coast region. She also attends the highly entertaining Cayamo Cruise which unites fans with some of Americana music’s best talent. We want to thank Mona for all she does and we look forward to attending lots of great shows and concerts with her in the future. Each month, The Southland Music Line recognizes devoted music enthusiasts as Music Fans of the Month. We attend live music shows with some of the best and most loyal fans of incredible music. 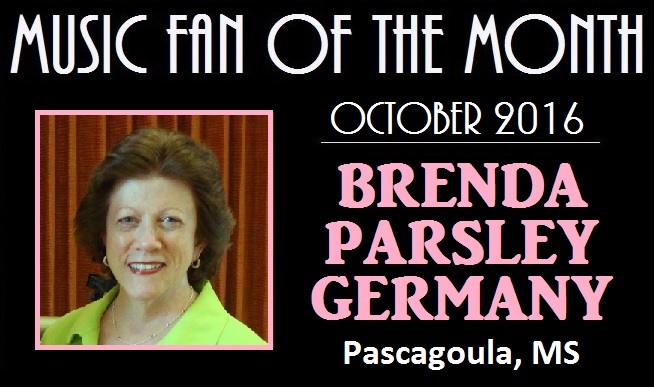 This month we have chosen Brenda Parsley Germany as our well deserved choice. Brenda can be seen attending shows across the Gulf Coast including The Frog Pond at Blue Moon Farm (Silverhill, AL), Callaghan’s Irish Social Club (Oakleigh Historic District in Mobile, AL), The Listening Room of Mobile, Alabama and the famous Jack’s by the Tracks in Pascagoula, Mississippi. We have enjoyed attending several shows with Brenda and look forward to many more. Two years ago, we at The Southland Music Line began recognizing devoted music enthusiasts as Music Fans of the Month. 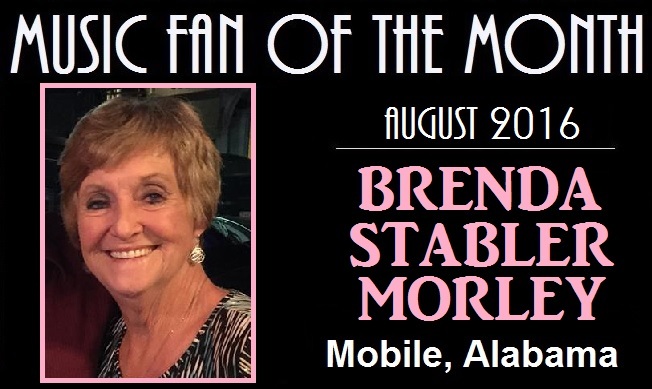 Our second recipient of this title went to Glenda Stabler Campbell and last month we named her sister, Brenda Stabler Morley as our choice for fan of the month. This month we are highlighting their good friend and fellow member of “The Duhs”, Linda Simmons Shelby. The Duhs (GlenDA, BrenDA and LinDA) are three of the most loyal supporters of the local music scene along the Gulf Coast. They have also been known to travel great lengths to support some of the region’s most treasured music artists like Grayson Capps. It’s an easy choice this month to choose Linda for her true love of great music. 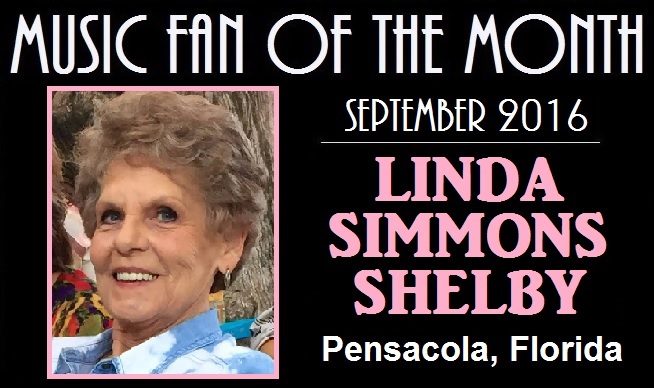 The sister of Glenda Stabler Campbell (a former Music Fan of the Month) and one of three devoted fans that call themselves the “Duhs” (GlenDA, BrenDA and LinDA), Brenda Stabler Morley is another easy choice for Music Fan of The Month. She supports the local music scene in her area and along with her two friends, Glenda and Linda, will travel a great distance to attend live music events. Most recently, The “Duhs” traveled to New Mexico and Colorado to attend shows by Grayson Capps and Corky Hughes. Brenda obviously loves good music and is equally loved by many of her fellow music fans. A music scene is defined by a distinct sound, several incredible musicians, a collective base of venues and a devoted cast of of fans. The Gulf Coast has those things and one such contributor to the scene is William “Norville” Harrison. He is the type of fan that consistently supports the musicians and venues by his attendance and his gift of spreading the word about the music. The Gulf Coast region of The South has some of the best music fans anywhere. Devoted, loyal and enthusiastic are a few words to best describe the good folks of this area of the country. 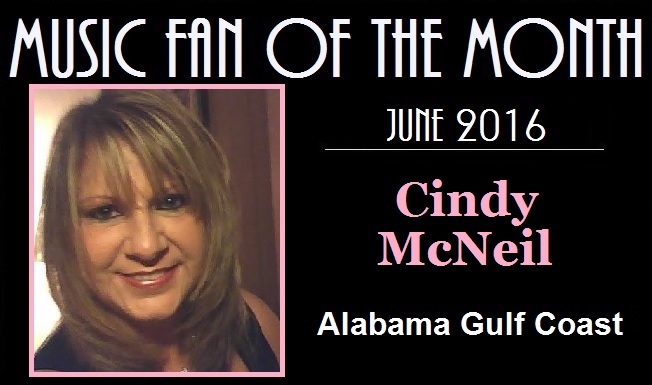 One such fan of spectacular music is Cindy McNeil of southern Alabama. Cindy can be seen with her many good friends enjoying music at places like Callaghan’s, Manci’s, Fairhope Brewing Company and the famous Frog Pond at Blue Moon Farm. 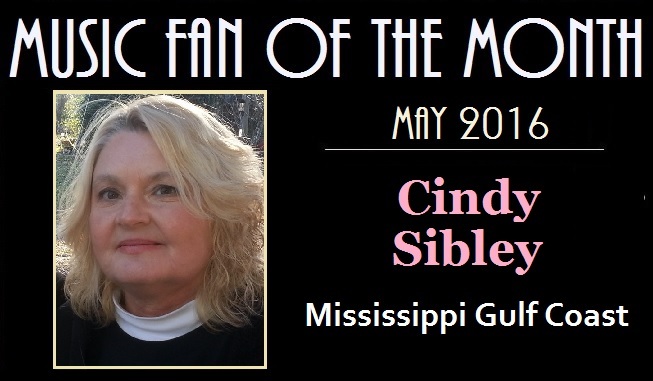 This month’s music fan of the month is south Mississippi resident Cindy Sibley, who regularly attends live music events and supports the local music scene. It’s a pleasure seeing her at shows by artists such as The Mulligan Brothers, Sugarcane Jane, and Grayson Capps. 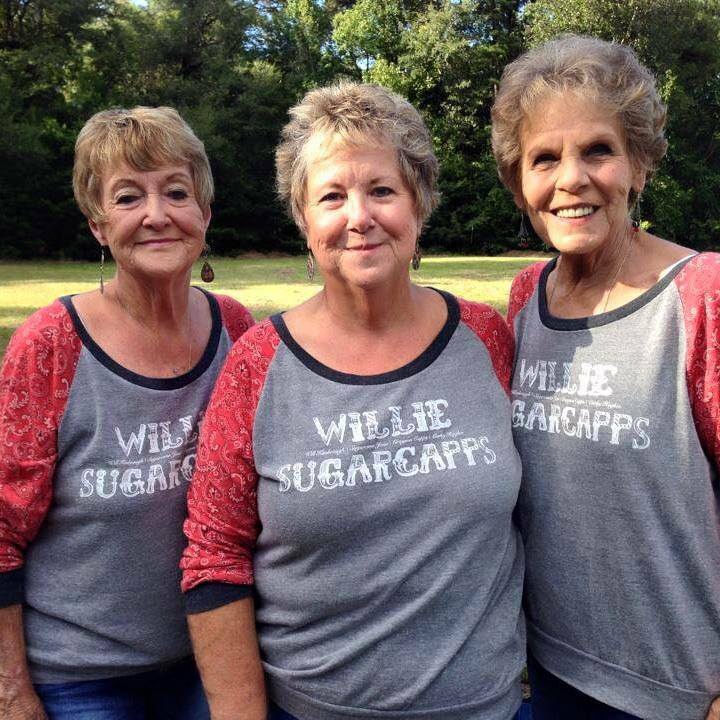 Recently, Cindy traveled to New Orleans to see the all-star ensemble Willie Sugarcapps perform on The Lagniappe Stage at the New Orleans Jazz and Heritage Festival. We look forward to enjoying more music with Cindy and thank her for supporting the local music scene. Each month The Southland Music Line highlights some of the region’s most loyal and devoted fans of music. One of the best places to meet such fans is at The Frog Pond at Blue Moon Farm in Silverhill, AL – home to some of the best live music in America. This month we want to highlight hula hoop artist/performer and dedicated music enthusiast Jay Everett. Jay is quick to point out upcoming live shows and new music at each visit to the Frog Pond. It has been a pleasure getting to know him and we look forward to enjoying more amazing music together. Who is “a great music fan”? 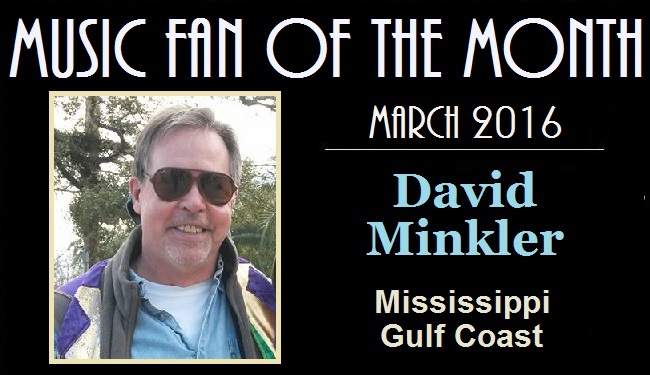 One needs to look no further than David Minkler from The Mississippi Gulf Coast. He enthusiastically attends shows across the region and purchases the music by the many bands and artists performing at venues such as Jack’s by the Tracks in Pascagoula, MS. David’s love of music is appreciated by all. The Southland Music Line thanks him for his encouraging words that bring joy into what we do as we recognize musicians, live music venues, and the best in today’s music. He is a huge part in what we strive to do. 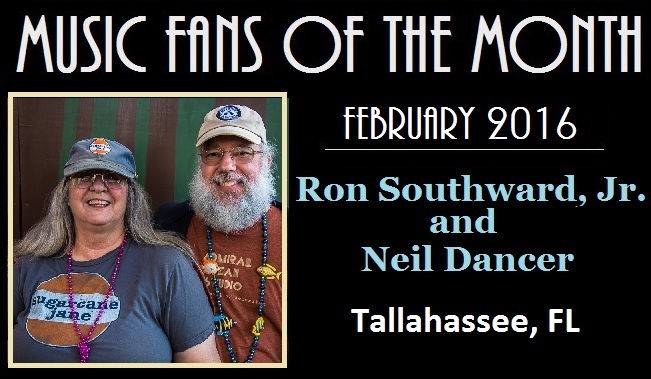 Long overdue, this month’s Music Fans of the Month are Ron Southward, Jr. and Neil Dancer. The two of them have spent years following some of music’s greatest (Neil Young) and have attended some of the best shows and events around the country (Farm Aid). 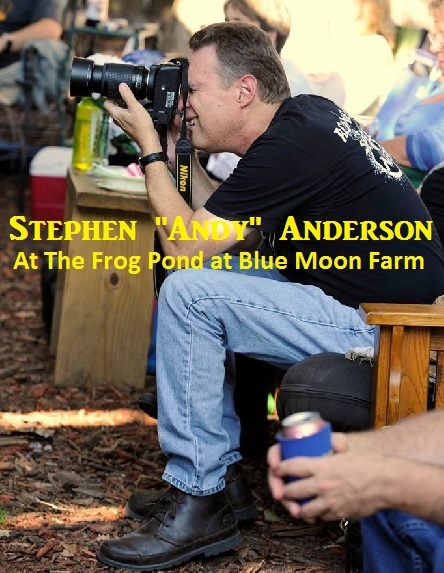 They travel miles to see some of the best live music shows around, including The Frog Pond Sunday Socials at The Frog Pond at Blue Moon Farm in Silverhill, AL. Their loyal support of the music scene is admirable and appreciative. 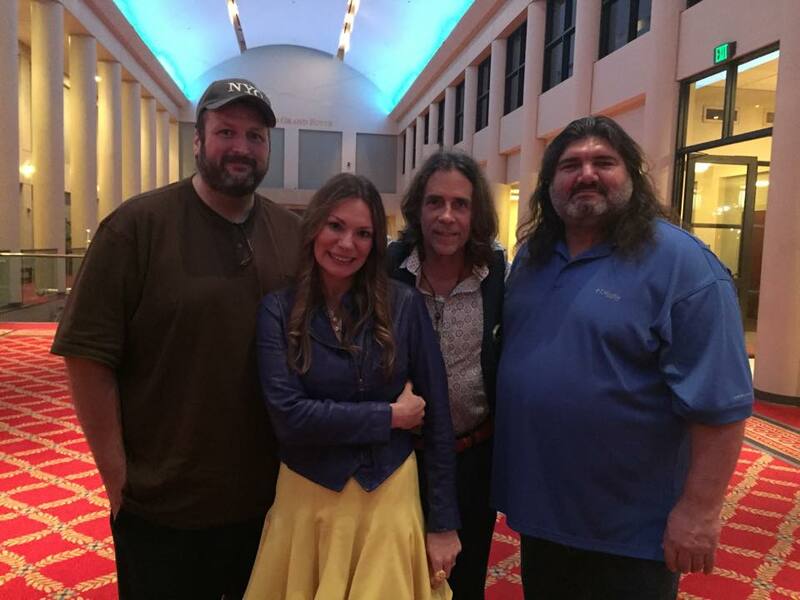 The Southland Music Line has attended several shows alongside Ron and Neil, some of the most memorable being Sugarcane Jane and Willie Sugarcapps. 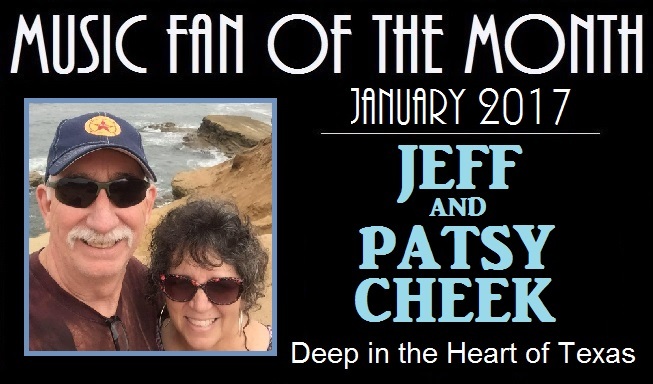 We are happy to name them as February 2016’s Music Fans of the Month. 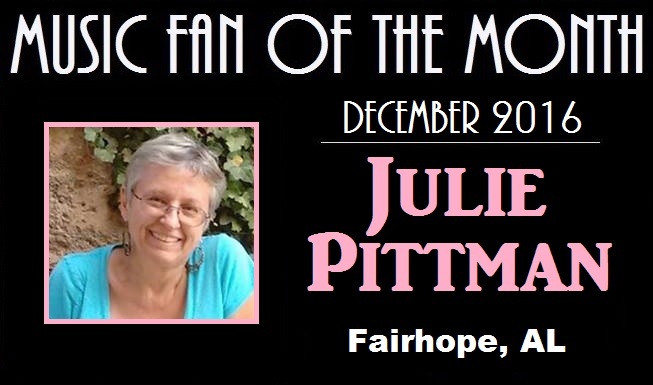 It’s our pleasure to recognize Phyllis Duncan as 2016’s first music fan of the month. Her enthusiasm for great music is addicting to her many friends. She is a loyal supporter of the local music scene along the Gulf Coast and travels across the region attending incredible music by amazing musicians such as Grayson Capps, The Mulligan Brothers and more. Plus, Phyllis helps make attending shows at The Frog Pond in Blue Moon Farm a memorable experience. We look forward to seeing her at shows throughout the upcoming year! 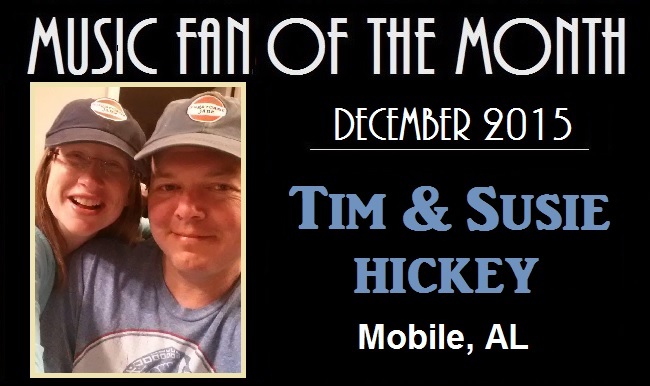 Tim and Susie Hickey are two of the most loyal supporters of the Gulf Coast music scene. The Mobile, AL couple contribute much of their time and hearts to the Frog Pond at Blue Moon Farm (the famous and much loved weekly outdoor music event in Silverhill, AL that takes place each and every Sunday from autumn through spring) The Southland Music Line is proud to acknowledge these two remarkable fans of sensational music. 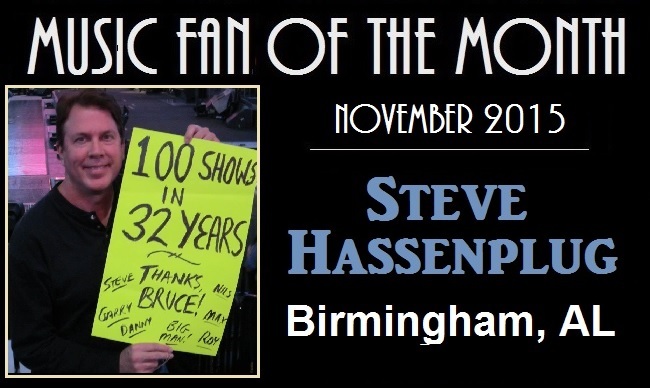 Steve Hassenplug is the definition of music fan. He has seen Bruce Springsteen more than hundred times since his first Springsteen show in 1980 – making him one of the ultimate fans of The Boss. The first time The Southland Music Line met Steve was at a Hard Working Americans show in Birmingham. AL. The sight of Steve’s Bruce Springsteen concert T-shirt sparked up a conversation and we are glad to have met this highly supportive fan of music. 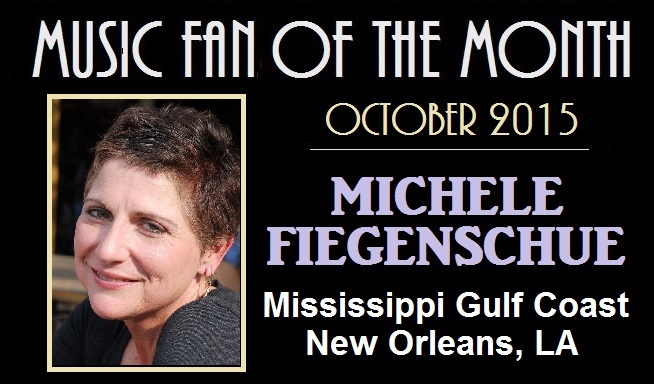 Michele Fiegenschue fully supports the local Gulf Coast music scene. She can be seen enjoying great music at venues up and down the coast. Being a music fan isn’t new to Michele – A longtime resident of New Orleans provided her ample opportunities to attend shows at such famous venues – The Riverboat President and The Warehouse (Michele, The Line’s Johnny Cole, photographer Stephen Anderson attended several of the same shows, but did not meet until years later). Since moving to the Mississippi Gulf Coast, Michele can be seen at Jacks by the Tracks, Murky Waters, The Government Street Grocery and at Alabama’s Callaghans and The Frog Pond at Blue Moon Farm. It must be added that Michele often assist others in getting tickets and awareness of upcoming shows. These and more reasons are why Michele is October’s music fan of the month. 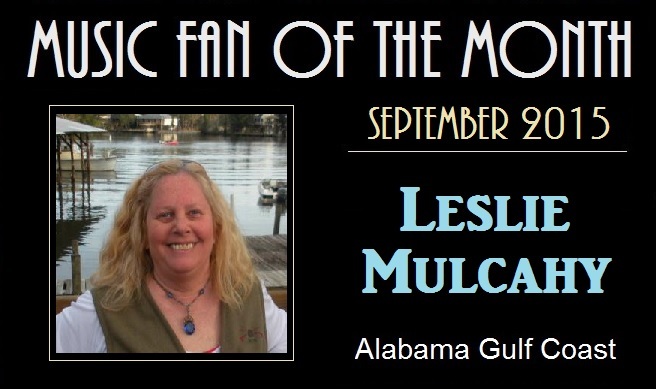 The Southland Music Line has been wanting to acknowledge Leslie Mulcahy as Music Fan of the Month ever since we began this feature. She contributes greatly to making the local music scene fulfilling. Leslie can be seen regularly at The Frog Pond’s Sunday Socials in Silverhill, AL (a highly popular weekly music gathering). During the Summer, she also host some most enjoyable music events at her own farm in L.A. aka “Lower Alabama”. For all she does as a loyal supporter of the local music scene, we have named her as September’s Music Fan of the Month. 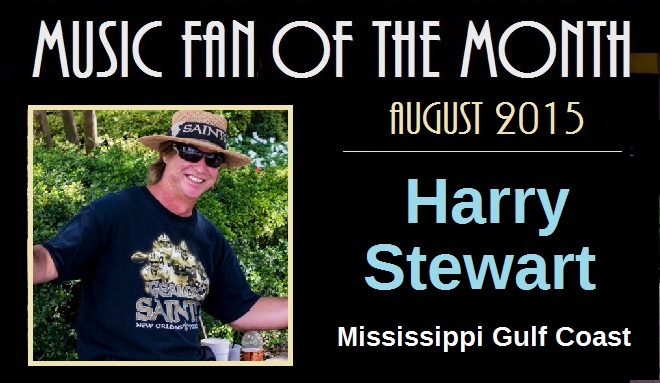 Our August 2015 Music Fan of the Month is Harry Stewart. 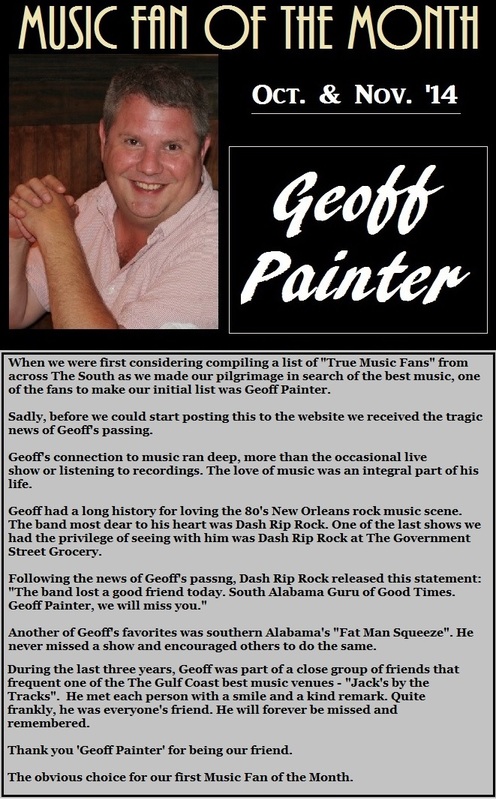 We recognizing him for being a true music fan and supporter of the Gulf Coast music scene is long overdue. Harry has an abundant and addicting love for music. His knowledge of musicians, bands and music history is one of the best we’ve come across. Above all, we here at The Line, a huge tour busload of musicians, venues and music fans value his friendship and enjoy seeing lots of incredible music together. It’s safe to say, Harry is very much an honorary contributor and part of The Southland Music Line. 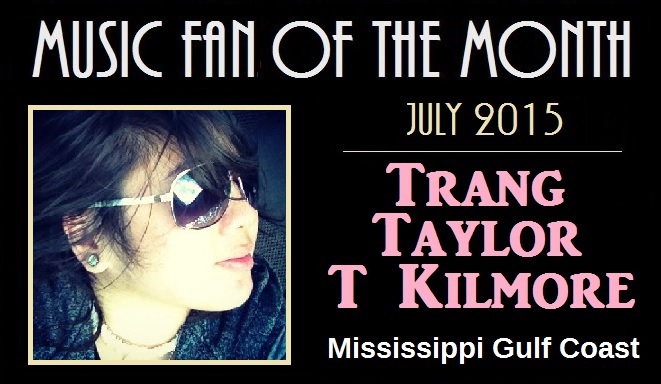 Trang Taylor T Kilmore is one of the most loyal fans of music along the Mississippi Gulf Coast. She can be seen regularly supporting several of her favorite musicians, including Della Memoria, Rosco Bandana and others. Above all, she’s well loved by her many friends and fellow music fans. 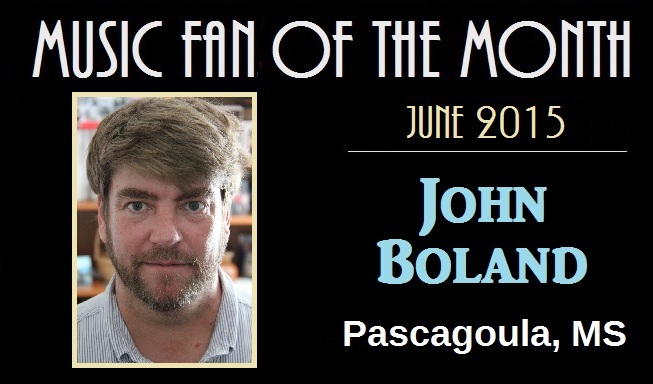 Jackson County, Mississippi’s John Boland is one of the most loyal fans of music on the local scene. He is part of what several musicians call the “Jack’s or Pascagoula Crowd” (music fans who regularly attend shows at Jack’s by the Tracks in Pascagoula, MS often travel distances to see some their favorite musicians). John has several favorite bands and musicians, but when it comes to Sugarcane Jane, he is clearly one of their most devoted admirers. 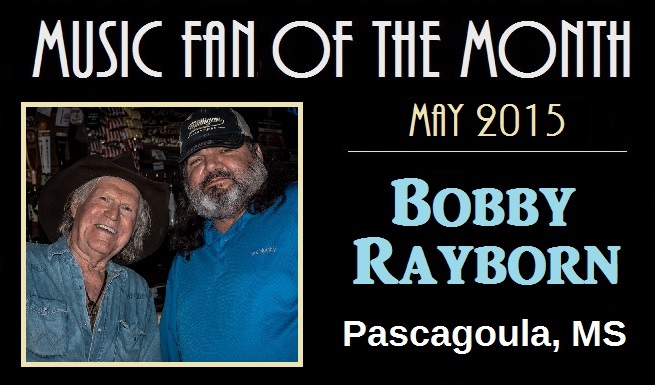 There are fans of music and then – ‘there are fans of music!” Bobby Rayborn is one such person. He keeps with him, at all times, a book that he continuously updates as regards to upcoming concerts. We have had the privilege of attending a substantial number of shows and road trips with Bobby, including ones to Nashville to see Dave Rawlings Machine at The Ryman; Billy Joe Shaver in Maryville, TN; multiple times to Jackson, MS; Birmingham, AL; Tupelo, MS; New Orleans, LA and more. He is the guy that goes to each concert and often purchases the musicians’ complete collection of CDs and has them signed. Bobby is also a major music enthusiast with the ability to spread the word about some of his favorites. 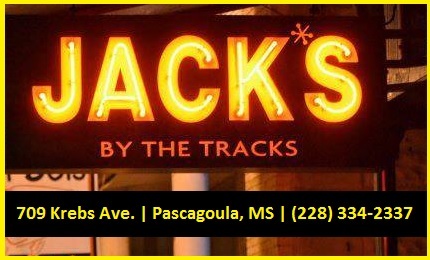 When not on the road, he can often be seen greeting customers and visitors at the famous Jack’s by the Tracks in Pascagoula, MS. 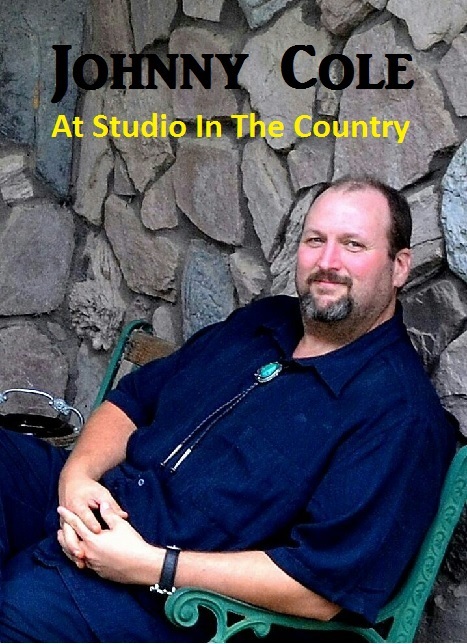 He is as much part of The Southland Music Line, as well, since he spends so much time with all its contributors. Above all, he’s our friend and we owe him a huge gratitude of thanks and appreciation. (The photo above is Bobby with Billy Joe Shaver; in Tupelo, MS; the one below is with (from left) The Line’s Johnny Cole, Savana & Anthony Crawford aka Sugarcane Jane with Bobby. Sugarcane Jane opened the show in Birmingham for Steve Winwood. 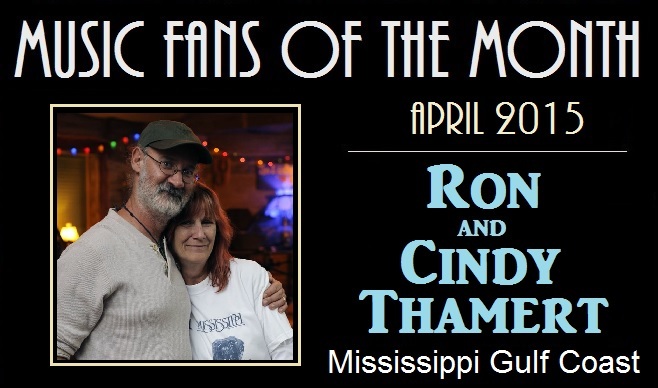 Mississippi Gulf Coast residents, Ron and Cindy Thamert, easily qualify as true fans of great music. They are huge supporters of the local music scene along the Gulf Coast and can often be seen in attendance at shows featuring such artists as The Mulligan Brothers, Andrew Duhon, Willie Sugarcapps and Sugarcane Jane (this month’s Spotlight Music of the Month and The Line’s Feature Story). Ron and Cindy are also regulars at the highly popular weekly music gathering at The Frog Pond at Blue Moon Farm in Silverhill, AL. The Southland Music Line is proud to call them friends and enjoy our times together. 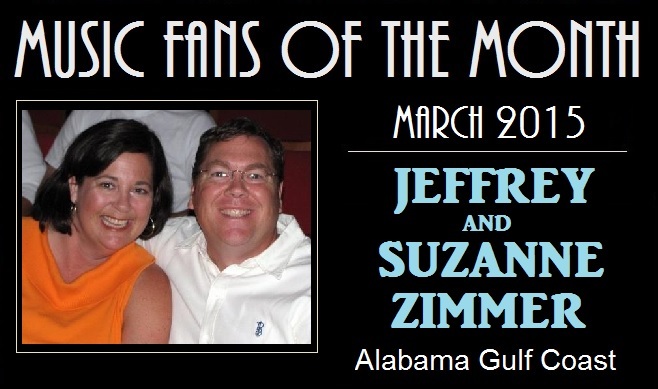 Alabama residents and married couple, “Jeffrey & Suzanne Zimmer,” are excellent examples of true music fans. When The Line discusses who should be named as that month’s selection, their name has always been mentioned with good reason. First of all, they are well loved by many friends and are devoted fans of the local, regional and national music scenes. They rarely miss a show at the famous “Frog Pond at Blue Moon Farm” in Silverhill, AL – a “must-see” to any fan of spectacular music. Each year The Zimmers also enjoy traveling abroad as part of the Cayamo Music Cruise (the annual Americana music festival-at-sea). It’s a pleasure to know them and enjoy so much incredible music together. 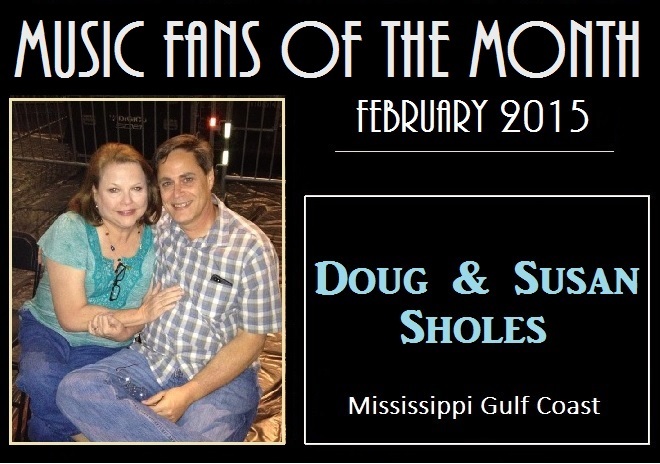 Mississippi Gulf Coast residents and married couple, “Doug & Susan Sholes,” are excellent examples of true music fans. They can be seen at live music events across the Gulf Coast region and abroad. Doug and Susan are from families who love and perform music: Susan is cousin to country music’s Moe Bandy; Doug’s father, George Sholes, was an accomplished jazz musician with the Port City Jazz Band; Doug is also a musician who performs at his church and can be seen sitting in on shows with their eldest daughter, Lindy, at places like “The Sea Grapes” in Gulfport, MS. All three of Doug & Susan’s children (Lindy, Tyler and Emily) have a gift for music. Their youngest daughter is a member of Della Memoria and has toured nationally as a musician. Doug and Susan are also known for their support of the local music scene and can be seen regularly at shows by dozens of local and regional acts. They have shown considerable amounts of support to The Southland Music Line. This remarkable couple’s friendship with us is appreciated, valued and has grown over the last few years – “The Line” thanks them! These and several other reasons are why Doug & Susan Sholes are February’s “Music Fans of the Month”. Mississippi Gulf Coast resident “Brice Creel” is another example of a true music fan. He fully supports the local music scene in his area and is often seen helping out local bands before, during and after shows. He attends live music events on a regular basis and informs everyone of upcoming shows. Also, Brice has a nice collection of music from a wide range of musical talent. The Southland Music Line has enjoyed many exciting shows with him. 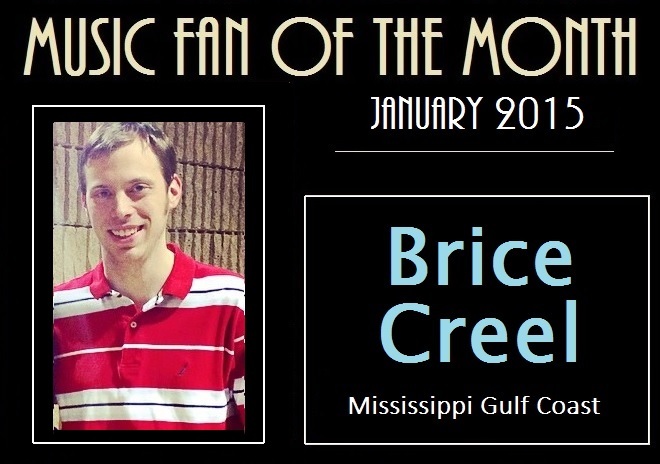 It’s easy naming Brice Creel as January, 2015’s Music Fan of the Month. 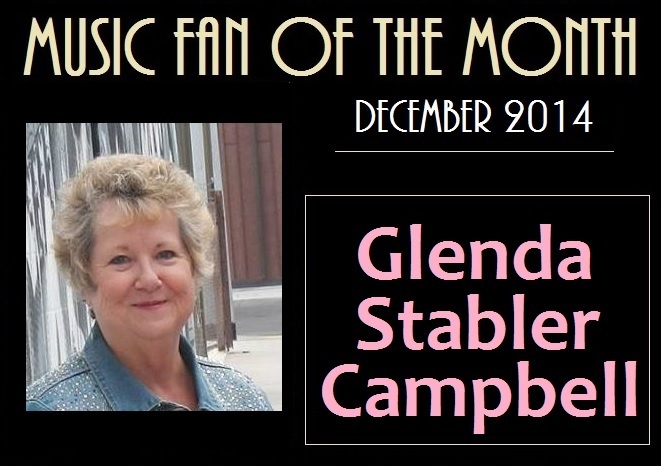 Gulf Coast resident, Mrs. Glenda Stabler Campbell is a perfect example of a true music fan. She fully supports the local music scene of where she calls home. As Grayson Capp’s #1 fan, she is also known to travel miles to attend his shows with The Lost Cause Minstrels or Willie Sugarcapps. A regular at The Frog Pond at Blue Moon Farm in Silverhill, AL, Glenda and her friends can be seen at each event “front and center” enjoying the show. Above all, Glenda is a friend to all she meets and makes everyone feel special AND for that we name her as this month’s Music Fan of the Month.